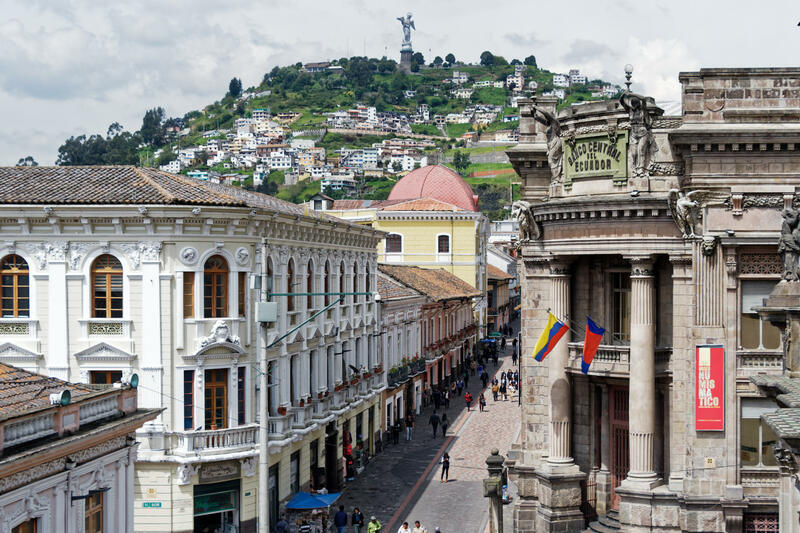 After the relentless tourism of the Galapagos, we flew to Quito, the capital of Ecuador, and, weatherwise, a very different proposition from the scorching heat of the islands, being a refreshing 19°C or thereabouts. 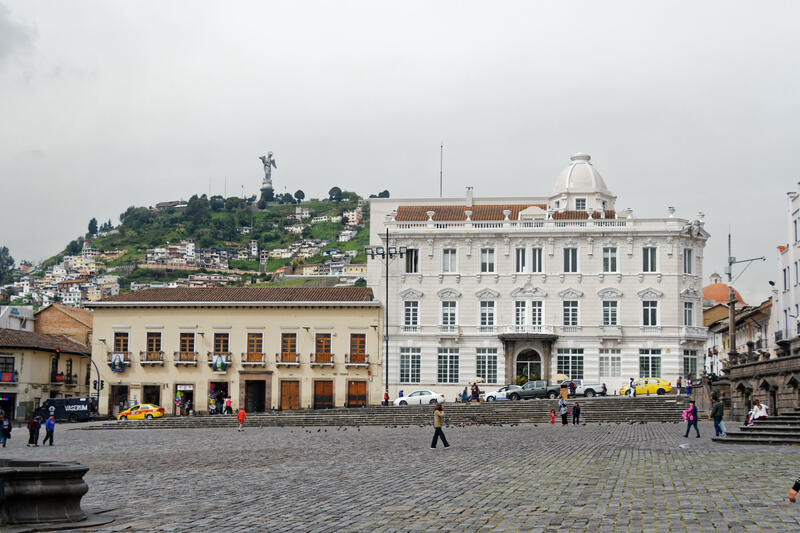 Our guide, Paul, delivered us to a lovely hotel in the old town of Quito, the Casa Gangotena. (it’s the white building on the right). It’s a very splendid place, old school posh, with remarkable decor, great service, and very good food in the restaurant. It was once the family home to a pair of sisters who had one bathroom and 15 servants each. For the last 6 years, it’s been a hotel and one I’d thoroughly recommend. Paul took us around the old town of Quito the next morning. The first thing he did was to lead us up some streets to a local market. 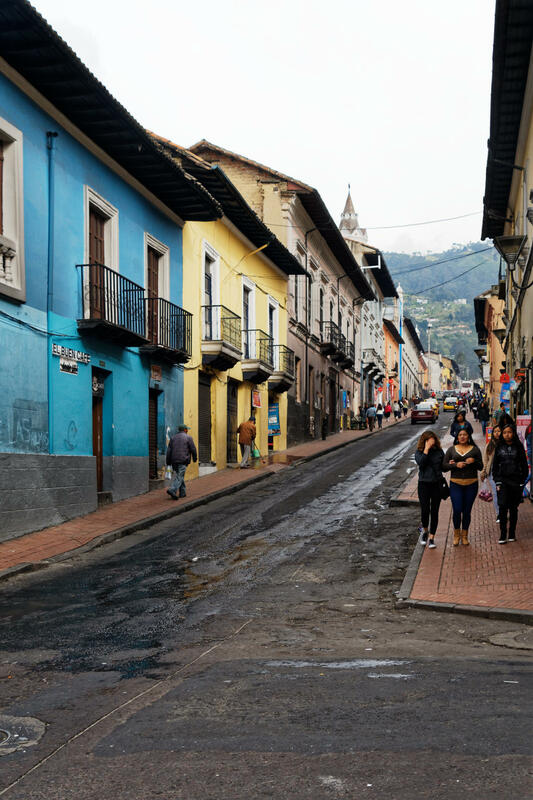 The streets are fascinating; colourful, ramshackle and quite scruffy, and some areas are really quite dangerous, although Paul assured us that things are much better than they have been. 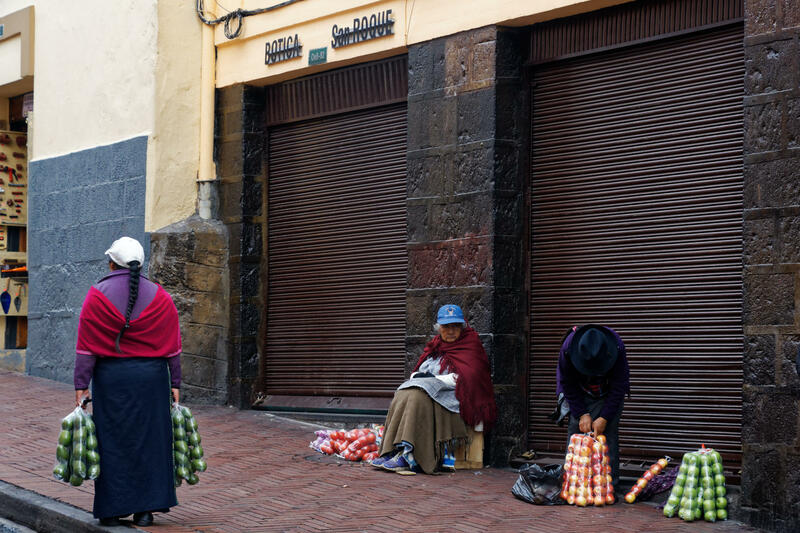 Although there are plenty of people just selling things on the street. 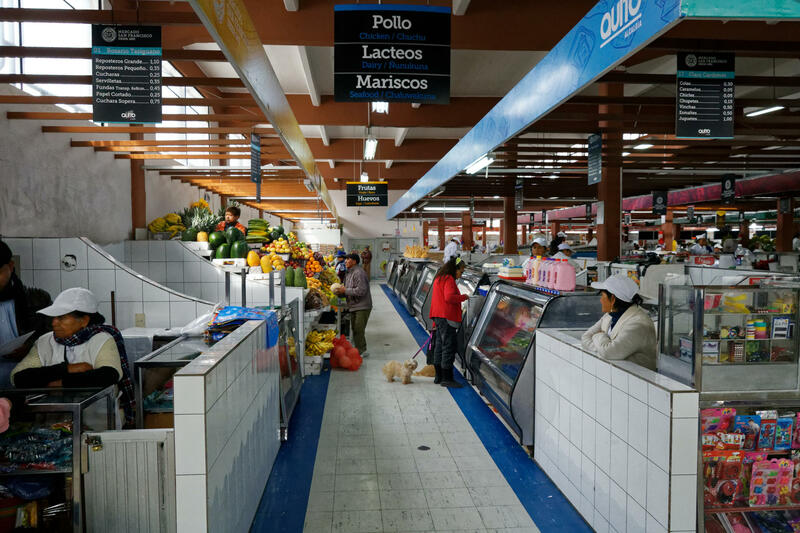 The market, called the San Francisco market (named after the saint, not the Californian city, and styling itself “Quito’s 1st Market”) is interesting to wander around, although I have to say I was glad Paul was there (a) to explain to the stallholders about the weird tourists he had with him, and (b) to tell the tourists he had with him about some of the weird produce which was on offer – a staggering variety of fruits, vegetables and meat, mainly organised in sections. 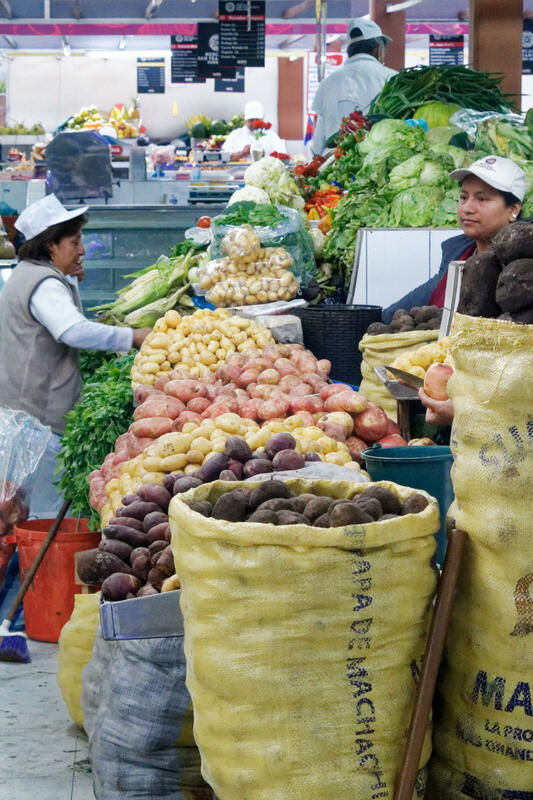 For example, this stall had more varieties of potato on it than you could shake a stick at. 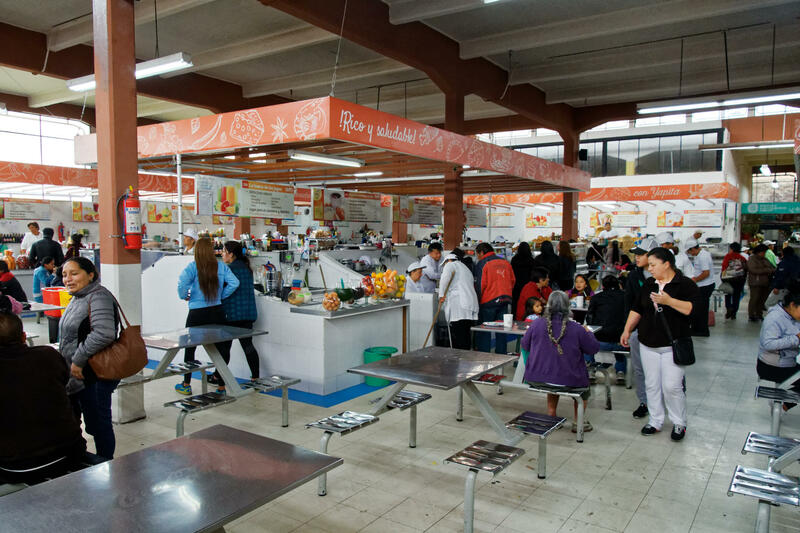 There was even a food court there. 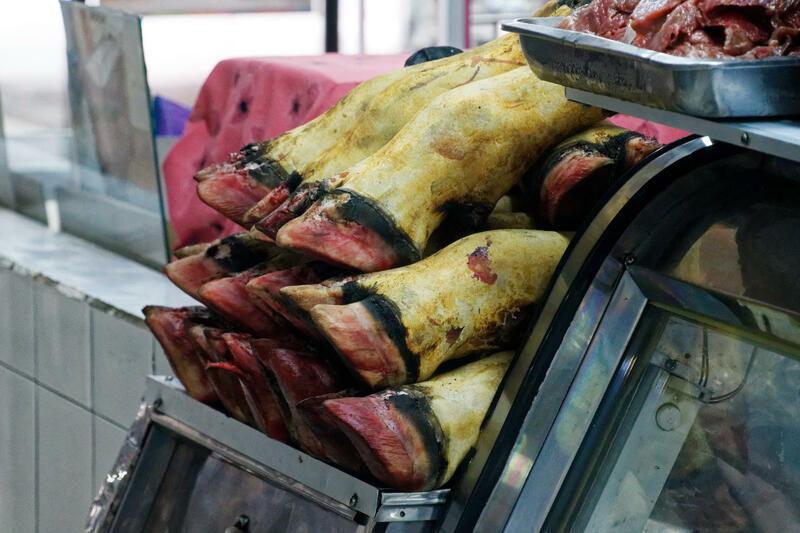 And in the meat section, Jane was particularly taken with the cows’ feet on sale. Paul then took us back to the square outside our hotel which features a huge Franciscan monastery and church, and is a stone’s throw from six other churches. 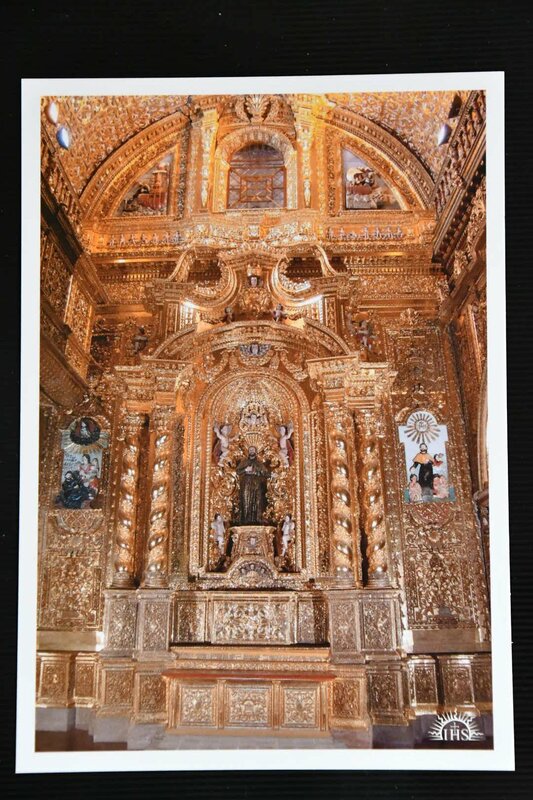 We visited the Jesuit church as well as peeking in the Franciscan church, and they are both absolutely stunning inside. Neither permit photography inside, which is understandable but annoying to me as a keen photographer. 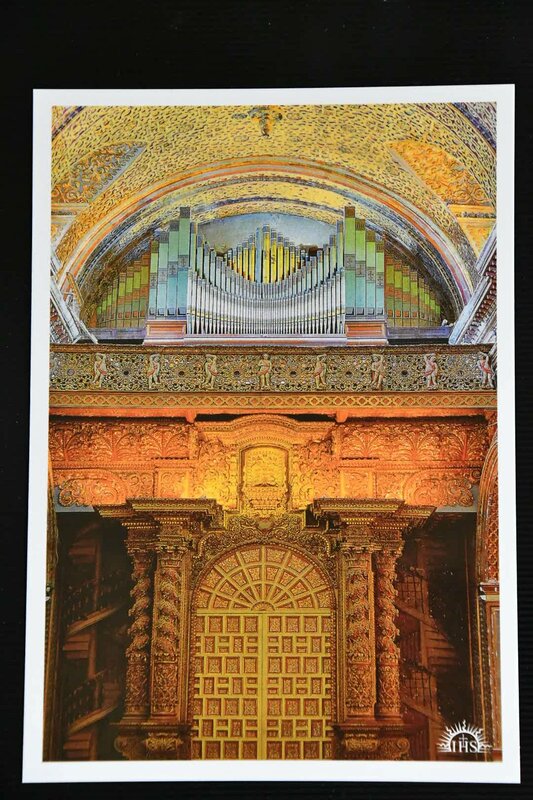 So here are photos of postcards we bought, to give you an idea. The interiors are extraorinarily ornate and sumptuously decorated. In the photo below, one of the two staircases up to the organ loft is actually trompe l’oeuil, just to maintain symmetry! 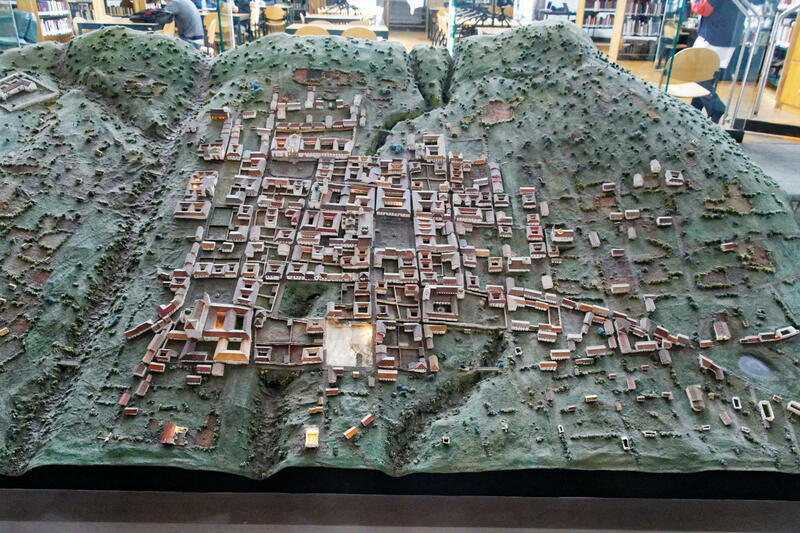 After that, we went on to the roof of the city library, which was once the Jesuit college and which had a relief model of the city, showing its extraordinary geography, situated above major fissures in the ground. The library roof gave us a couple of nice views. 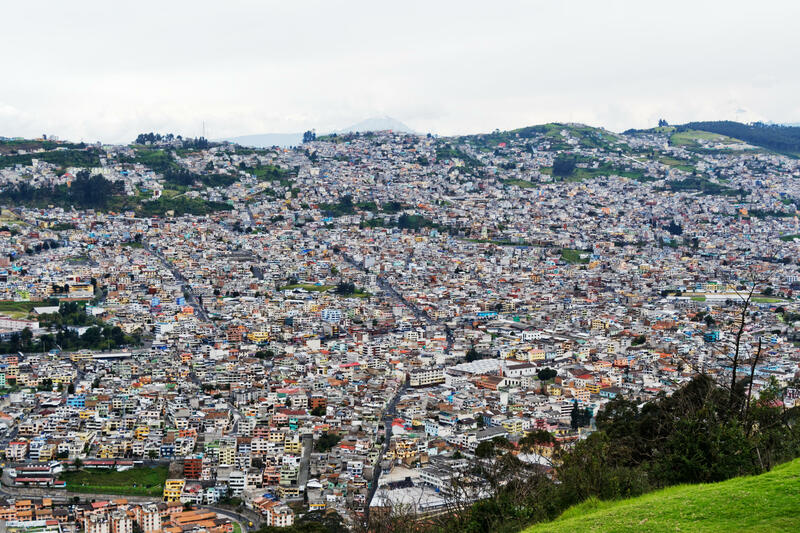 Just as well, really; Quito is at quite some altitude (2800 metres, or one-and-three-quarter-miles, high) and lugging my camera backpack up two flights of stairs left me feeling pretty breathless, so I’m glad the view was worth the climb. 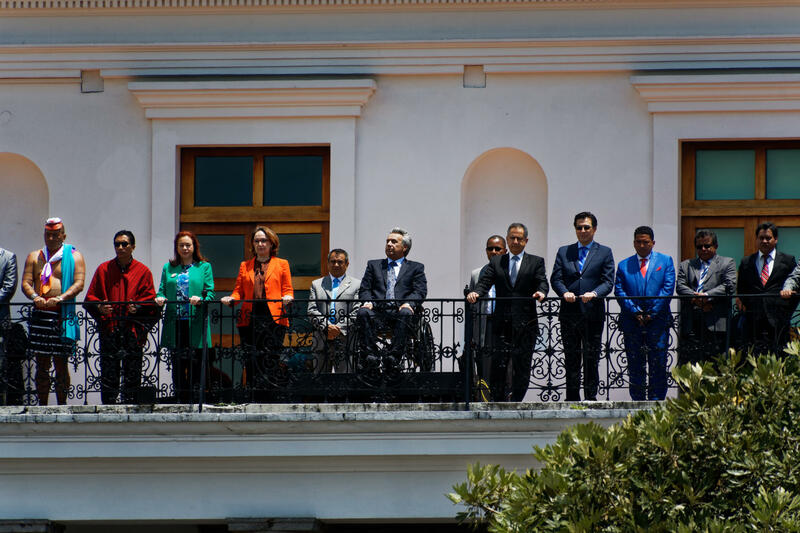 with marching bands of the guards taking the weekly pledge to guard the president, Lenin Moreno (the chap in the wheelchair) who was watching the proceedings from a balcony in his palace. I captured a lot of video of the proceedings, but you’ll have to wait until I can produce some kind of edited footage. It was good to have seen this piece of weekly theatre, anyway. 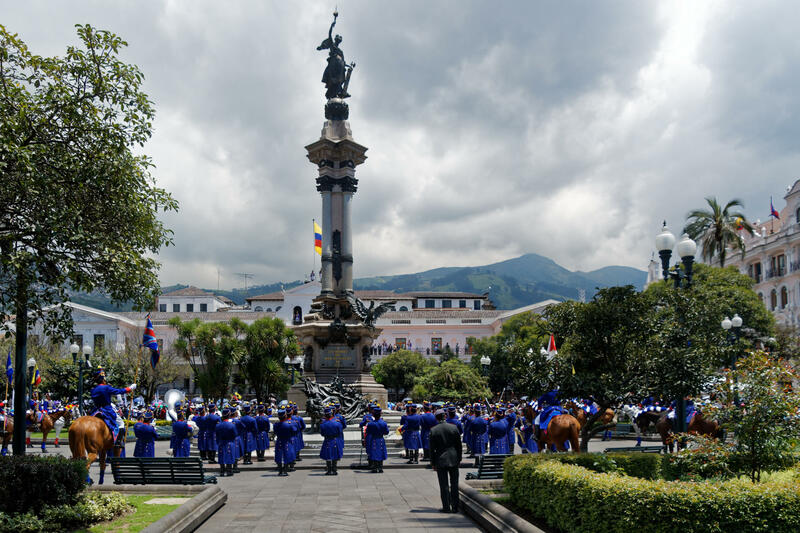 After this excitement, it was time to depart for the actual equator, which, for those who didn’t pay attention in geography lessons in school, is what gave Ecuador its name. 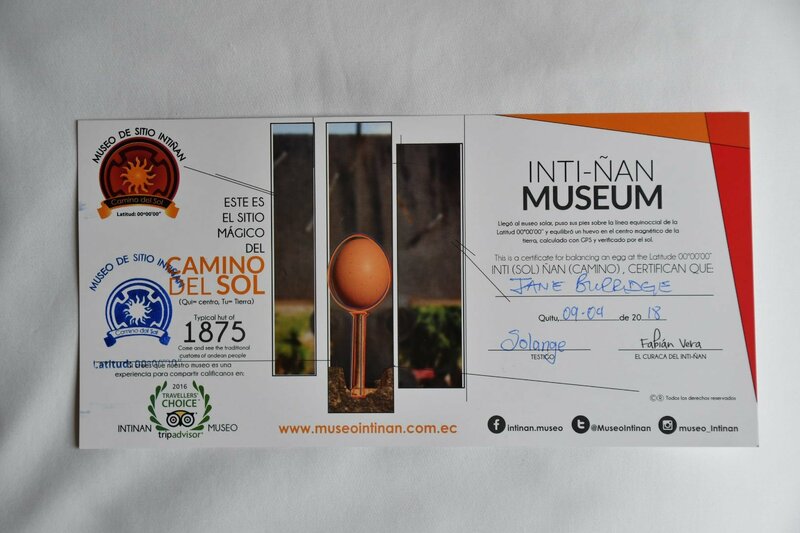 There’s an attraction called the Intiñan Solar Museum, some 40 minutes drive north of the city. It’s a bit cheesy, but guided tours ensure you get a few nuggets of science and history out of a visit. 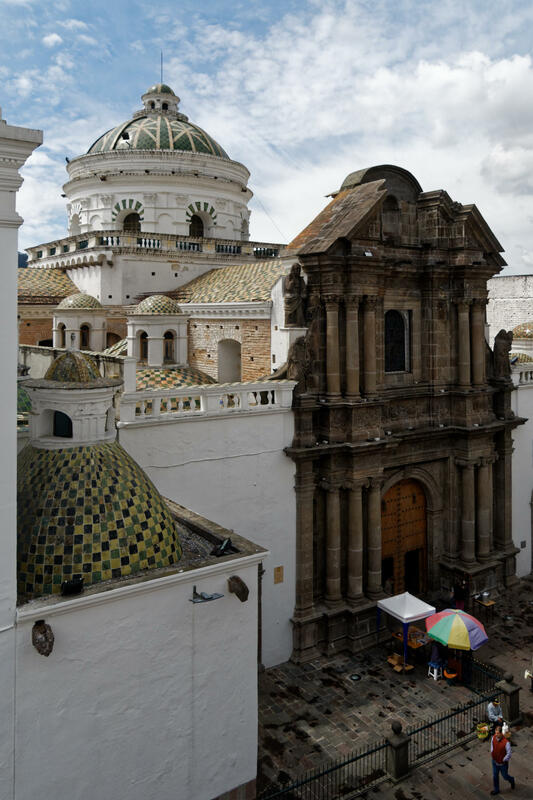 Today’s Ecuador was shaped mainly by invading Spanish forces, who arrived in the 16th Century, only a few decades after the Incas. The indigenous peoples (who predated the Incas by many thousands of years) were of several tribes, but had worked out that this region was on the Equator. They called it “the middle of the world” which sounds presumptuous, since the equator passes through land in other places, of course. 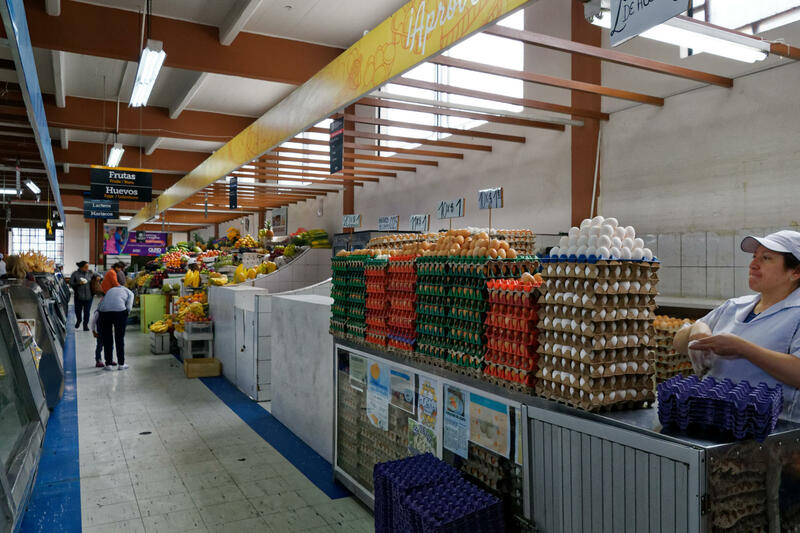 However, pride of place is claimed on the basis that Ecuador’s equatorial altitude is higher than any of the others – the assertion is made that one is thus typically two pounds lighter standing on the equator line here than at sea level. There is, of course, a line marked in the ground to show where the equator runs. Yes, you can have your photo taken on it. No, I’m not going to share it. You can have this one instead. 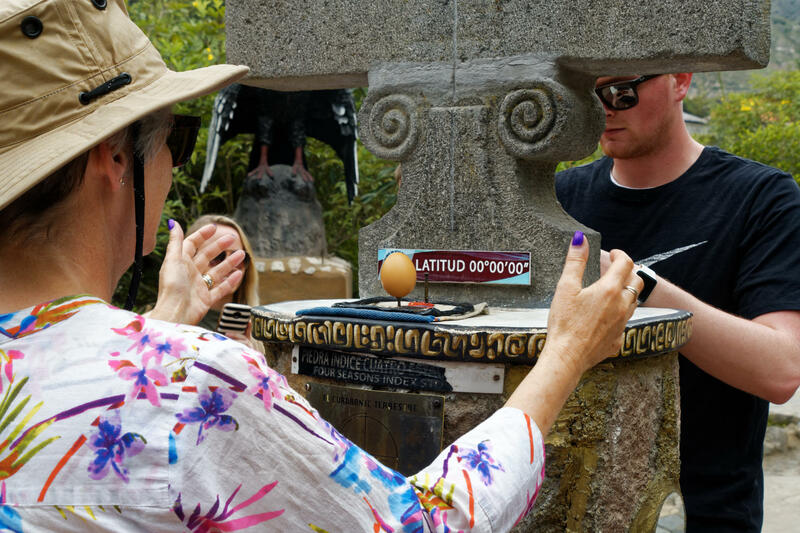 Visitors are challenged to walk the equator line (heel-and-toe) with eyes closed. Since I can hardly even stand on one leg with eyes open, there was no point in my trying this. and got a certificate for it, too. As well as all of the flummery around the equatorness of the place, some serious nuggets can be gleaned about the indigenous pre-Inca inhabitants. 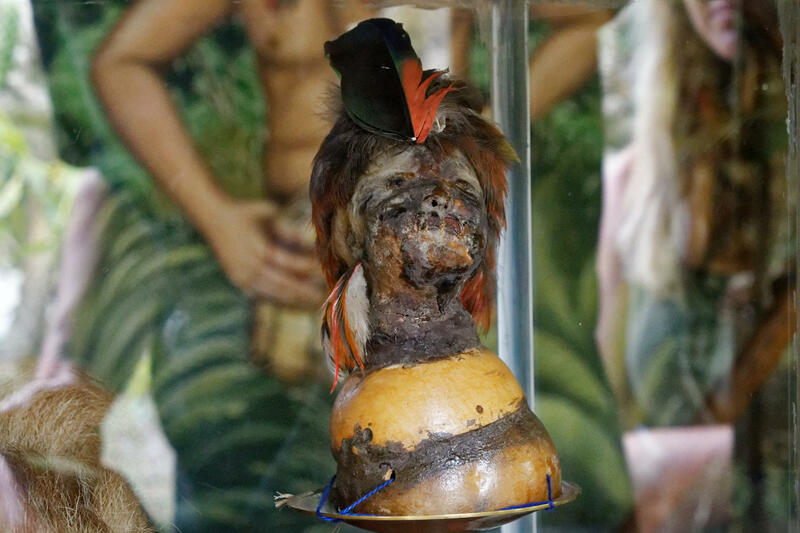 Apart from anything else, the Shuar people (part of the Jivaro tribe) were headshrinkers, and the process of headshrinking is described: decapitate the subject; remove and discard the skull; seal the lips, eyes and nose; simmer the head in a boiling pot for a couple of hours; dry and smoke the head; and finally brandish the head on a spear (to scare others if subject had been an enemy), or wear it as a necklace (if subject had been a respected person). Whatever, the result looks like this. 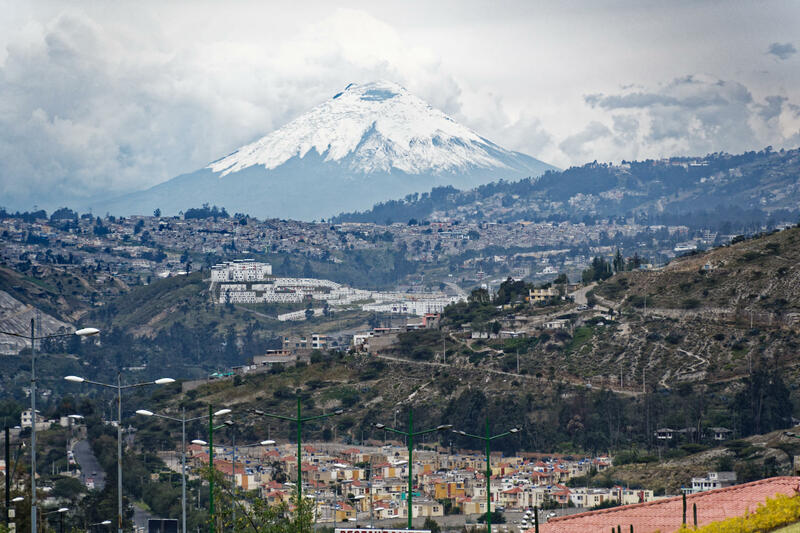 On the way back from this museum, we even caught sight of Quito’s best-known volcano, Cotopaxi. 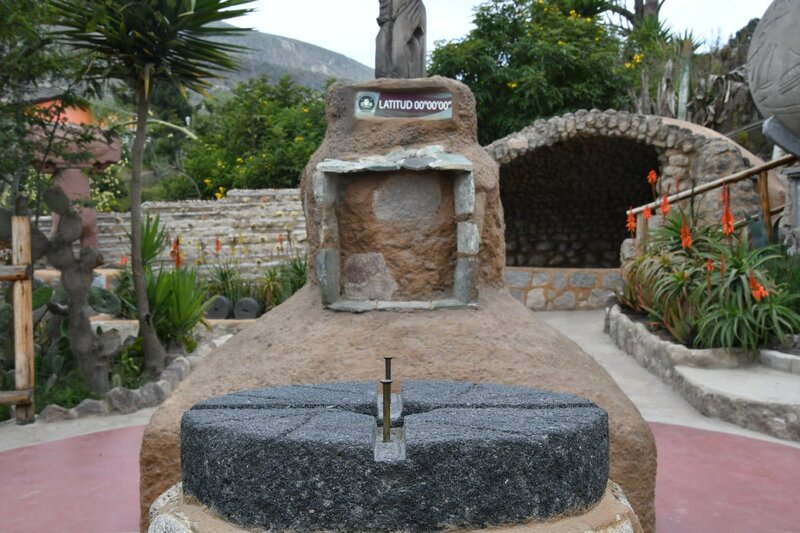 Paul had one more delight for us; a visit to a hill call El Panecillo, which features on it a giant statue of the Virgin Mary, the only one sporting wings (based on text describing the Woman of the Apocalypse in the book of Revelation in the Bible). You can see the statue in the background of the first picture in this post. 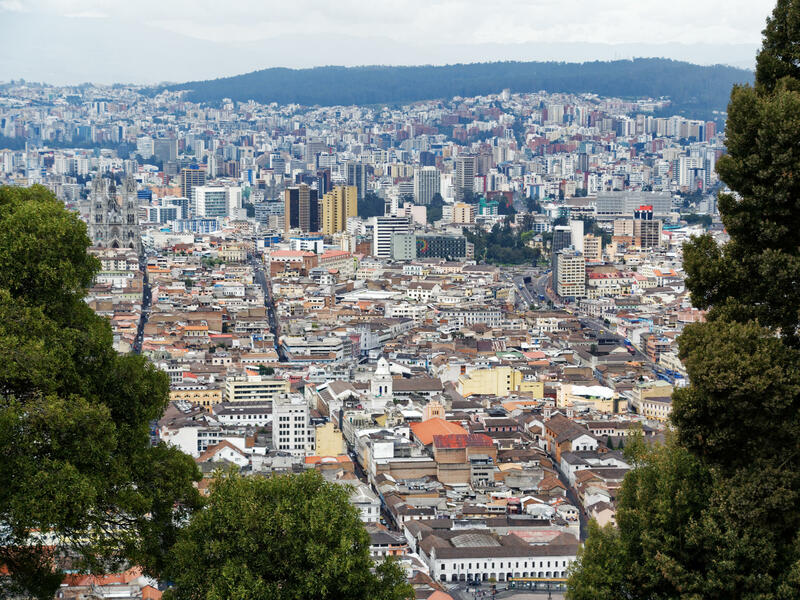 From the top of the hill where the statue stands, you have a 360° view across Quito, and you see what a sprawling place it is. 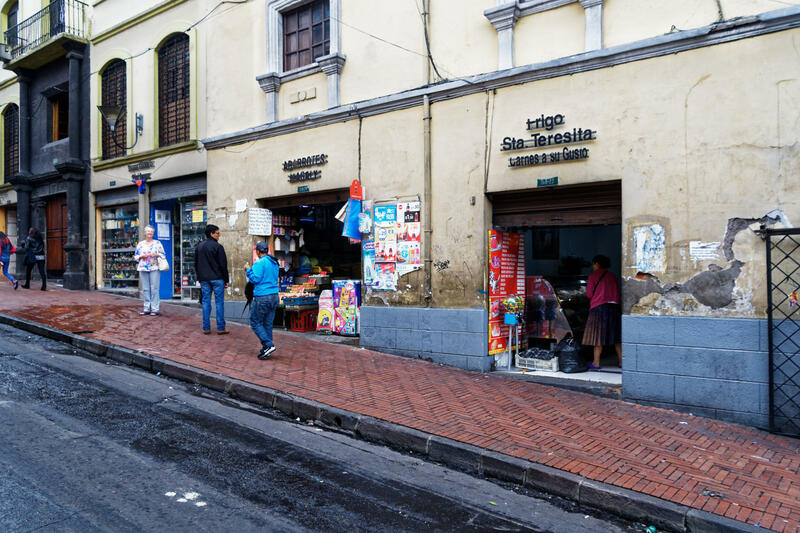 Quito is a remarkable place, one I’m glad to have seen, although not necessarily one I’d be keen to walk around by myself, particularly at night. The hotel was lovely, and our guide Paul did a great job in making sure that we’d been able to see and understand some important aspects of its life, history and culture.